‘The basics,’ those ever-elusive things about which creative writing students are accustomed to hearing, encouraged to practice, and – speaking from personal experience – eager to upgrade. They’re something Trina wants to remind us of as we aspire to new sets of skills, leave the classroom, and strike out on our own. She hopes the truth of the titular sentiment will resonate with listeners, and speaking from personal experience (again), I’ll say it definitely does. You can listen to the podcast on our iTunes Channel, #199. You can read “The Body” in Superstition Review Issue 15, and listen to Trina Young read it aloud in podcast #155. Trina Young is a graduate from DePaul University with a passion for many kinds of writing. She was one of the winners of the Pegasus Young Playwrights competition in 2010, and has had one poem published by Afterimage Online’s Inklight gallery. 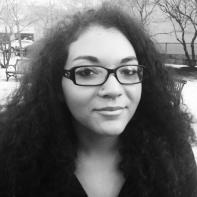 She recently received the honor of placing third as a Gwendolyn Brooks Poetry Award Winner in the Illinois Emerging Writers Competition. She continues to submit to journals in order to build her credits and be included among many other talented people. She currently writes for Blavity, a site for black millennials to fight the stereotypes against them, and is pursuing a career in television writing as well. She lives in Chicago, IL. Today we’re proud to re-feature SR contributor Trina Young reading her poem “The Body” on our podcast, with her related Authors Talk forthcoming. You can listen to the podcast on our iTunes Channel, number 155. You can read Trina’s work in Superstition Review, Issue 15. Her Authors Talk podcast was released on March 4th, #199.